Today is the start for the Spring and Summer Coffee Lovers Bloghop! 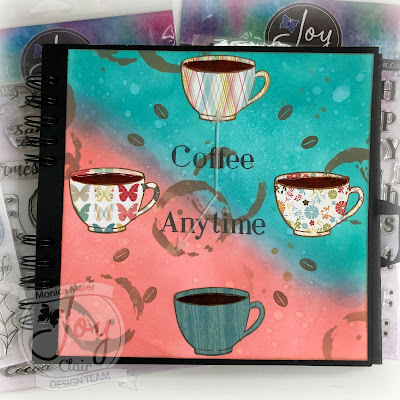 I'm so excited to be playing along with Joy Clair, be sure to stop by the Joy Clair blog to sweet what my teamies made to play along! For my project I was inspired by bright seasonal colors as well as butterflies and flowers! I decided to create an art journal page in appreciation that I love my coffee anytime! ;-) This could be cute to do again to show all for seasons. I used distress inks to color the back ground and spritzed with water. I then added some beans (stamp) and stenciled on the coffee rings. I stamped the cup images on some coordinating pattern paper and fussy cut them. I then colored in the coffee with a copic and added glossy accents over it. I die cut two arrows from vellum to create the hour and minute hands, then glued them to the center. Hope you get inspired by any of the stops along the blog and play along. The hop always has wonderful sponsors and it's fun to play along! Thanks for stopping by and have a great day! This is such a fun card! I love the background. This is awesome, Monica. THanks for sharing your fabulous Joy Clair inspiration. Love seeing your creativity! 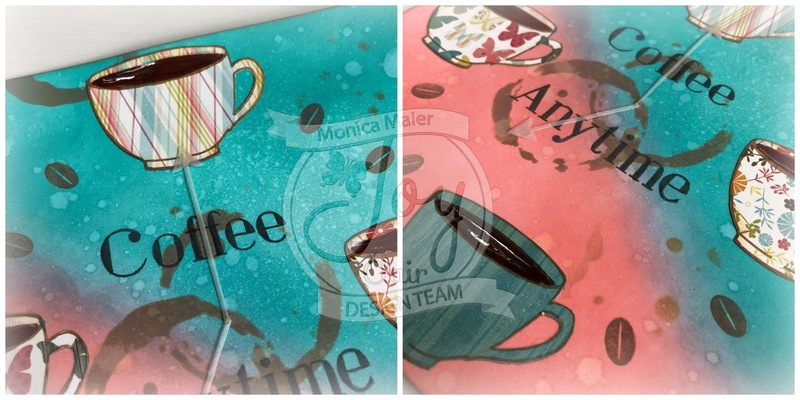 Monica, this is a terrific summer coffee card! Love the fun colors too! My new favorite color combo! Brilliant! Wow! Beautiful background! Great card! What a fun project! I had to double check to see if it was real! Love the new stamp set!